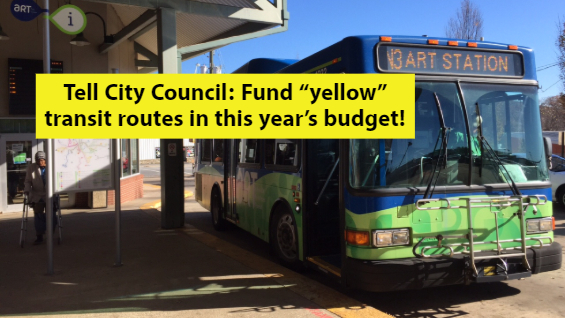 Call on Asheville City Council to Fund Transit Route Improvements for Historically Disenfranchised Communities! The I-26 Connector is the single biggest development project facing Western North Carolina. Over the past 18 years, MountainTrue has served as a community convener to reduce the project’s impact on Asheville communities that stand to be most affected. 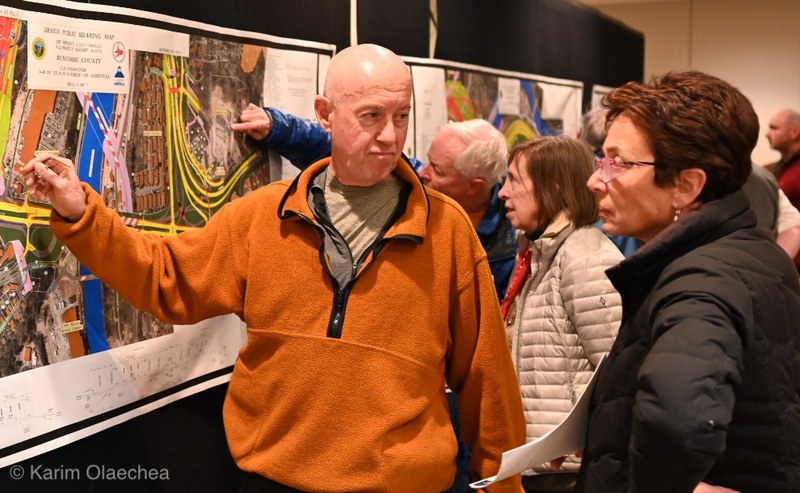 At last night’s public hearing on the draft maps for the I-26 Connector, MountainTrue Co-Director Julie Mayfield and Asheville Design Center Director Chris Joyell spoke about the history of this work, which has seen some victories as well as losses. Their public comments appear below. The hearing last night demonstrated that there are strong feelings in our community that this project should not move forward or that it should go back to the drawing board for redesign. While we would not argue with that and have long looked for opportunities to challenge the project, we have simultaneously worked to improve it. Analyze the Final Draft Environmental Impact Statement (EIS) for the project, which will be produced by the NC Department of Transportation (NCDOT) early next year, to determine the grounds for any legal challenges to the I-26 Connector. 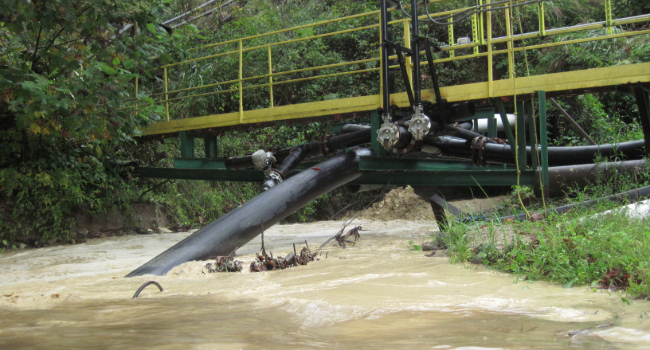 MountainTrue has approached this project through a legal lens since 2008, submitting comment letters prepared by our attorneys at the Southern Environmental Law Center in 2008 and 2015. These comment letters cite concerns related to the failure to include the goals of the Community Coordinating Committee; the failure to minimize neighborhood, business, and environmental impacts; segmenting the project illegally in violation of the National Environmental Policy Act (NEPA); and more. We will continue to bring a critical legal eye to this project and will ensure NCDOT complies with federal law in the final EIS. Act as a convener for the community at large and neighborhoods specifically impacted by the I-26 Connector project to champion their concerns. We will continue to empower these neighborhoods to share their concerns with NCDOT as we enter this next stage of design. Encourage public comments on the I-26 Connector by January 4. You can submit your comment through our action page here. My name is Julie Mayfield, and I am here tonight speaking in my multiple roles as Co-Director of MountainTrue, a member of Asheville City Council, and an Asheville resident who loves this city. Having worked on this project intensely for 10 years, my relationship with it is complex and conflicted. It makes me angry, it makes me sad, and it makes me anxious for the future of our city. I literally dream about this project – although unpleasant dreams are usually called nightmares. Most days I wake up wishing that we didn’t need it, wishing it were not so large, wishing so many people weren’t going to lose their businesses and homes, wishing we could be building something visionary and so very different. Wishing it would just go away. But it is not going away. Our city leaders asked DOT in the 1980s to bring the highway through town and while there might have been a later time when Asheville could have said no and successfully fought for it to be routed somewhere else or not built at all, that time is long past. The fight here has never been to kill the project. Many of you may think that would have been the better fight. And there are days I wish that had been the fight. Instead, the approach Asheville residents and leaders have always taken is to make it better. From the Community Coordinating Committee report in 2000 that laid out design principles, to the I26 Group that fought the proposed eight lanes in West Asheville, to the 2008 Asheville Design Center-created Atl. 4B, to the I-26 ConnectUs Project that has advocated similar design principles since 2009, to every statement City Council has ever made on this, the aim has been for the project to be smaller and less impactful, to have better bike/pedestrian connectivity, to separate interstate from local traffic and return Patton Avenue to a surface street. Three years ago when I stood at this podium commenting on the draft Environmental Impact Statement, I again called on DOT for all of those things. Standing here today, I must acknowledge that DOT has listened and responded to our calls for a better project in several important ways. Three years ago, we asked for six lanes through West Asheville instead of eight. We got six. Three years ago, we asked to minimize the harm to West Asheville, Burton Street, Emma and Montford. By selecting Alt. 4B and with additional effort, DOT has spared an additional 50 houses and businesses. Three years ago, we asked for full connectivity at the I-240/I-40/I-26 interchange with minimal cost and the smallest footprint. We got that. Three years ago, we asked for bike and pedestrian access through the project. DOT’s maps now reflect over 5 miles of new multi-use paths and greenway connectors that will better connect neighborhoods to each other and to the river and West Asheville to downtown. Three years ago, we asked that Patton Ave. become a boulevard and gateway entrance to downtown. That is now possible. These are the bright spots that give me some measure of hope that the benefits of this project will be worth the burdens. There are, however, things we asked for three years ago that we have not yet gotten. One was that all interchanges and intersections be designed with the tightest footprint and turning radii possible to improve pedestrian safety, save homes and businesses, and retain Asheville’s urban design. There have been some improvements here, but not enough. And most important. while Patton Avenue can now theoretically become a boulevard and gateway, we need more from DOT in order to set the table for the redevelopment Asheville has sought for close to 20 years. Specifically, the interchange on the east side of the Bowen Bridge, Patton Avenue east of the bridge, and the Bowen Bridge itself need to reflect the City’s vision, most recently detailed in the memo prepared by the City’s consultant, Sam Schwartz Engineers. As a surface street, the design of Patton Avenue and the Bowen Bridge must reflect the City’s priorities, not DOT’s. Our streets must be designed for people, not just cars, and we cannot yield this critical corridor and public space to traditional transportation planning. Patton Avenue can be Asheville’s grand boulevard, our Champs-Elysees, our Las Ramblas, an iconic street where people live and work, shop and eat, and travel safely on foot, by bike, in buses and cars. This can be a destination, not just a corridor for passing through. These outstanding design issues will make or break this project for the people who live here. This is what people will look back on 30 years from now and judge whether we got it right or wrong, whether the benefits of this project outweighed the burdens. 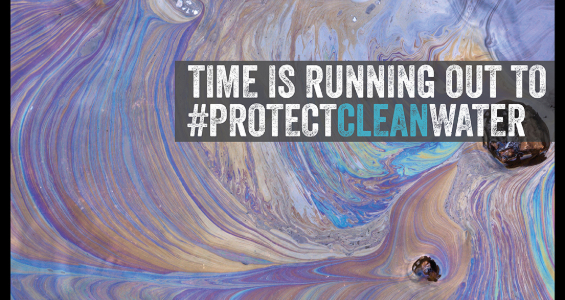 We have no choice – we must get it right. DOT, I call on you to support Asheville in getting it right, in making the benefits worth the burdens, and in creating a place we can all share and be proud of. My name is Chris Joyell, and I am the Director of the Asheville Design Center. As a resident of Asheville for the past 14 years, I recognize that I am a bit of a newcomer to this project. So I reached into the Asheville Design Center’s archives to educate myself, and I thought I’d share that history with everyone here tonight. I think we can learn a lot from the path we’ve taken to get here, and I believe that this history can guide us in how we shape the I-26 Connector Project and Asheville’s future. When NCDOT first proposed the Connector Project in 1989, it sparked widespread concern among Asheville residents. In 2000, the community organized in earnest to influence the plans, creating the Community Coordinating Committee. MountainTrue (then the Western North Carolina Alliance) co-chaired the CCC, which issued a report recommending nine key design goals aimed at minimizing impacts to neighborhoods and local businesses, while improving neighborhood and bike/pedestrian connectivity. More specifically, the report recommended separating interstate and local traffic on the Bowen Bridge and returning Patton Avenue to a surface street. In 2006, a group of volunteer designers formed the Asheville Design Center. They hosted multiple community meetings, workshops, and design charrettes to create a community-authored design for I-26 that met the CCC’s goals. Eventually called Alternative 4B, this design received broad community support, and the City of Asheville and Buncombe County funded an engineering study to prove that the community plan was feasible. In 2009, DOT committed to include a revised version of Alternative 4B in their draft Environmental Impact Statement. Also in 2009, the neighborhoods that stood to be most impacted by the project came together to form the I-26 ConnectUs Project. MountainTrue was and is the lead convener and coordinator of this group, using its expertise to amplify neighborhood concerns with DOT. 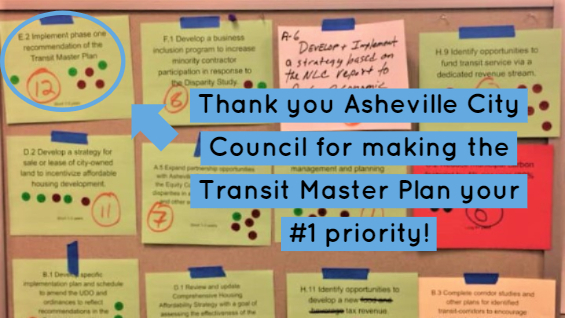 When DOT issued a draft EIS in 2015, Asheville City Council passed a resolution in support of the community’s vision. Advocacy and organizing paid off when, in 2016, DOT selected Alternative 4B as the preferred alternative. In 2018, DOT announced it had significantly reduced the footprint of the highway in West Asheville following two years of collaborative design work with the City and its residents. Thanks to thousands of community members like the folks here tonight, we have made enormous strides in scaling back the I-26 Connector Project. But we’re not finished. The City, MountainTrue, ADC, and others in our community will continue to advocate for the transformation of Patton Avenue into an urban, tree-lined, multi-modal corridor envisioned by the community in 2000. Tonight I ask NCDOT to continue listening to our community and to work with us to get it right this time.